New South Wales, 1945. Kate Dowd goes with her father to the train station to meet two new workers coming to work on their station, Amiens. Bought under the soldier-settler scheme, Amiens is one of the few stations that has been profitable in the area, but with Kate's father seeming to be losing his grip on reality, signs begin to point to that no longer being the case. Add to this the new workers themselves-- Italian Prisoners of War, Luca and Vittorio. Kate doesn't trust these newcomers, and worries about being virtually alone with them, many kilometres from help. I expected good things from this novel. It sounded exactly like the kind of book I love, and in many ways the premise reminded me of one of my favourite books of all time, The Paperbark Shoe by Goldie Goldbloom. But I got more than I expected, because Joy Rhoades' debut novel is a marvel. From page one, I was immersed into the world of the story, both the time and place completely unlike my own. Kate is an unusual heroine for a novel of this sort. 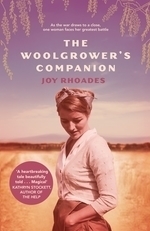 Rather than the usual fare of historical novels, where women tend to think much like women of today (not that I have a problem with that-- it's a great way to reassess some of the old notions of bygone eras), Kate is a bit more of a product of her time. She's concerned about behaving like a lady, as her mother has taught her-- so she doesn't know about doing the books and accounts for the farm, and doesn't know much about how it's run on the day to day. She's also suspicious of the POWs who have come to live with them, suspecting that they will pose a threat to both herself and to their young Indigenous kitchen maid, Daisy. However, it is through her interactions with these men, Daisy, and young Harry, as well as the necessity for her to take over the management of the station on the sly to cover for her father's declining mental state, that Kate has to decide whether being conventional is more important than her family and her home. Deciding that it isn't, she takes matters into her own hands. If I had to find a word to describe Kate at the beginning of the book, I would probably choose prickly. She's a bit aloof and a bit judgemental, and certainly very proud. Yet by the end of the novel, she's learned to let go a little, and learned where her true priorities lie. The hardships of 1945 test Kate's spirit, and she comes out the other end of the story a much stronger person, and a much more likeable person. At the beginning of the novel, much of her thinking about the future involves the fact that her husband, Jack-- whom she met and married whilst he was recovering from an injury, before being sent to Sydney to train troops (meaning they'd only really known each other a few weeks)-- would be returning. Jack's letters indicate that he wants to move them away from Amiens to start their own life together, but Kate's plans had always involved the two of them staying at her family home. Jack is an off-the-page character for most of the book, and the reader gets to know Kate's very limited memories of him before they meet the man himself. As Kate has been trying to ignore burgeoning feelings for Luca, the fact that Jack turns out to be thoroughly not right for Kate is a happy revelation, at least in my view. And though the ending of the novel, and the resolution as far as this love triangle goes, is not necessarily Kate riding off into the sunset with Luca and Jack having to eat sour grapes alone with his mate from the pub, it's not Kate being bundled into the back of a truck by her husband as Luca waves sadly goodbye either. You'll have to read it for yourself, because I won't be saying anything other than-- it's realistic and bittersweet. Clearly a lot of research and thought has gone into the writing of this novel, and I'm almost sad that I borrowed the book from the library instead of buying one now because it's gorgeous inside and out. I highly recommend this novel and I gave it five out of five stars.